I've now been using my Clarisonic nightly for 2.5 weeks. I wanted to update you on the current condition of my skin - keeping in mind that everyone's skin is different. I maintained the same skin routine with my Clarisonic which is: Kate Somerville DTX Cleanser, The Body Shop Tea Tree Toner, Kiehl's Dark Spot Corrector, Clinique acne spot treatment, and my Korres Pomegranate gel moisturizer. I also always do a weekly mask which is usually my Origins Charcoal one. I did not want to switch up my skincare until I got it under control with the Clarisonic just so I would get the most consistent results. I am going to be switching to the Kate Somerville oil free moisturizer once I run out of my Korres because I got a small size in my 500 pt perk from Sephora.I broke out pretty bad all over my chin over a week ago and it's all starting to heal now. I got 3 cystic acne spots and I haven't suffered from this since early Summer before I went on an oral acne prescription from my dermatologist for 3 months. I noticed that my cheeks looked way better - I am not as red and I can see my blackheads and whiteheads surfacing but my chin went crazy. It's probably the worst my chins been in a long time but I knew I had to just push through after reading many reviews of people suffering the first few weeks after starting to use the Clarisonic.I knew it was just bringing up all the dirt that was deep in my pores so it was purging. I am happy to say that now 2.5 weeks later all my cystic acne spots surfaced and are now just tiny spots that are healing. I have not had any new spots surface in the past 3-4 days other than seeing more of my blackheads and whiteheads coming to the top. 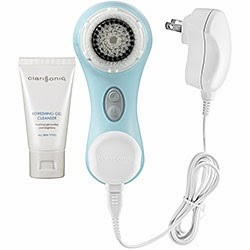 Once my skin gets under control completely I will start trying to decrease my use of the clarisonic to 1-2 times a week in order to prevent too much exfoliation even though it is gentle enough for everyday use, you can never be too careful with your skin. I have noticed a huge difference in my skin and I'm extremely happy. Plus with all the makeup my clarisonic gets off after I wash my makeup off is amazing and I can't believe all that was still deep in my pores. I'll put another update in maybe 1-2 weeks to let you know how my skin is handling it for a longer period! I was skeptical too that's why I had never purchased it previously myself. Getting it for Christmas was perfect and I'm so happy with the results because I have such sensitive acne prone skin that I really didn't expect my skin to improve this much this fast. I highly recommend it!